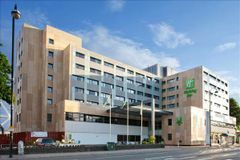 The Holiday Inn Cardiff City Centre is situated in a fantastic central location, a short walk to the Principality Stadium and Cardiff Central Station. Also well located for the nightlife hot spot of central Cardiff, there are numerous bars and restaurants just a short walk from the hotel. The hotel is easily accessible by car, with onsite parking providing a perfect location for golfers playing in and around Cardiff. Well located in the centre of Cardiff, the hotel has 157 air conditioned rooms, with views of the Principality Stadium and Cardiff Castle from the bedrooms. All rooms are en-suite with WiFi available throughout. Guests can head to Callaghan's Sport Bar to watch live sport on the large screens whilst enjoying a wide selection of refreshments. The well appointed Junction Restaurant provides an excellent range for your evening meal, with the Hotel Bar allowing guests to chose from light snacks and refreshments in a relaxed atmosphere.